Are you interested in developing your social enterprise or enjoying a career in this existing growing sector in our community? 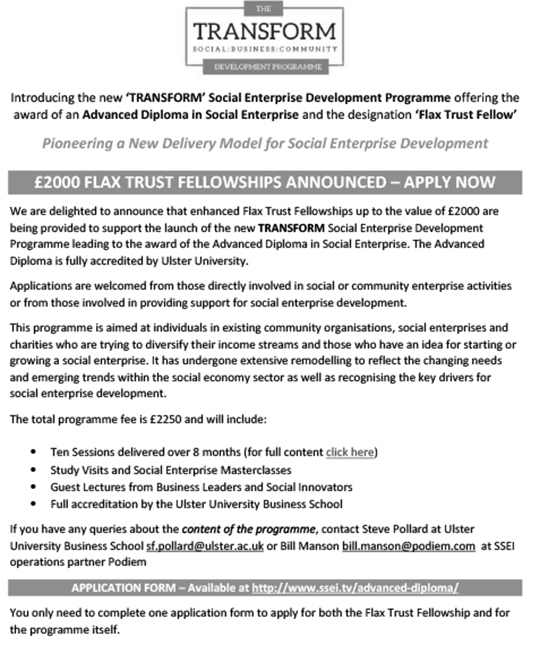 The TRANSFORM social enterprise programme delivered by Ulster University and subsidised by the Flax Trust may prove to be a way forward. You get the benefit of peer support and feedback, excellent tuition and will have at your fingertips all the tools, ideas and skills necessary to make a success of your involvement in projects and development in the social enterprise sector. Following a major redesign of the Advanced Diploma in Social Enterprise the School for Social Enterprises in Ireland (SSEI) are delighted to announce that the new ‘TRANSFORM’programme is being launched today with enhanced support of Flax Trust Fellowships up to the value of £2000.